Corsair has released their Raptor HS40 headset, a very sleek looking simple gaming headset, with a fairly modest price tag accompanying it. It has a well built sturdy design, that feels durable and will last a lifetime, but it also encompasses a comforting feel which allows you to wear the Raptor for hours on end, with long gaming sessions. It may struggle to compete with higher tier gear such as the Siberia 150 or the HyperX Cloud II. The circumaural design provides a comforting fit, with noise canceling earcups. When testing the Raptor for a 6-hour gaming session, I did not experience any pain or discomfort when wearing it, or after wear. The majority of the headset is colored in a matte black finish, however, the cushioning headband is colored in a pink-purple and the earcups are the same color. For the price, the headset performs very well. The HS40 features 7.1 surround sound, giving gamers an advantage on their enemies, as you can now hear them from any direction that they try and sneak up on you from. It also features 40MM neodymium drivers helps lower distortion in the sound, and increase sound quality. The microphone is noise canceling, so it removes all outside sound and only provides the input sound that you send directly into it. The Raptor may not be able to compete with the most high-end headsets, but it is definitely worth the money, since it is so cheap, yet such outstanding quality. Corsair has really developed an advanced headset, with simple, but effective features for a very cheap price. We tested the headset with movies, FPS games, and even virtual reality. We felt like we were fully immersed in the virtual world with the VR and the sound quality was sufficient enough for us to think that the surroundings producing the noises were real. This speaks wonders for the HS40 and shows that quality can really come at a cheaper price point. Overall I would highly recommend the Raptor HS40 to any avid gamer who can’t afford a top tier headset, but still wants the core features that come with the high-end peripherals. Although you won’t have any fancy flashing lights or crystal clear audio quality, you will have a durable, comfortable and long-lasting headset with decent sound quality to use. For the price the HS40 Raptor is a steal. 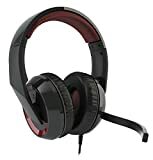 Greatly priced headset, with above average performance and an awesome sleek durable yet comfortable design.